CPC 200 is a powerboat handling immersion course designed specifically for those who wish to improve their close quarters maneuvering skills. 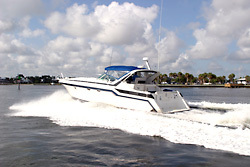 This 12 hour, hands on program is conducted onboard one of Chapman School’s training vessels (up to 32 feet*) by professional US Coast Guard licensed captains who use Chapman’s proven "Learn at the Helm”™ method of teaching. 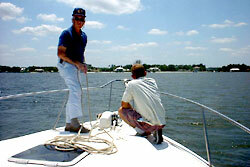 The skills learned in this class are fundamental requirements for the competent boater. *For instruction on vessels greater than 32 feet, please contact the Registrar for pricing and availability. It is designed as a stand alone program. Successful completion of CPC 200 earns the student certification on either a twin or single inboard vessel or an outboard/stern drive vessel. 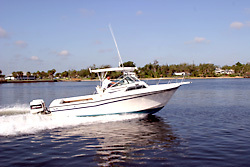 This valuable program is highly regarded by both experienced and novice boaters alike. The 2 days / 12 hours of underway instruction will be held on a vessel that is either : I/O or Outboard; Twin or Single Inboard. Docking and Undocking in a protected slip, bow and stern first. 360 degree turns in tight quarters. Coming alongside a facing pier (such as a fuel dock), both port and starboard to. Docking bow and stern first with only one engine operable. Docking and undocking using springlines. Proper use of VHF marine radio. Understanding and using Navigational Aids and basic Rules of the Road. Persons attending this program must be at least 15 years of age or older and have a serious desire to learn. Each student must submit a Registration Form completed and signed (by a parent or guardian if under 18). Students must have an official photo ID on the first day of class. Each student is required to furnish his/her own deck shoes. Each class requires a minimum of three (3) students. Should you be the only student in the class requesting a particular vessel type, such as IO, you will receive private hands-on underway instruction on a six-hour schedule. A Chapman School certificate of completion is awarded to students who complete the course. 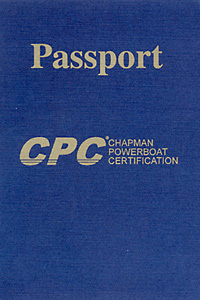 This certificate may qualify a boat owner for marine insurance discounts. Those students seeking CPC 200 Certification must pass a boat handling skills test which will be given at the conclusion of the program.